Fiebing's signature product. Used all over the world on fine saddlery, boots, shoes and other smooth leather articles. Cleans leather and lubricates the fibers to prevent brittleness, all the while maintaining suppleness and strength. Formulated in yellow, white and black. Fiebing's Black Saddle Soap Paste works especially well on all black harness and tack. Directions: Dampen a cloth or sponge. Rub lightly over the saddle soap to produce lather. Then apply to the leather surface. When dry , polish with a soft cloth for light luster. 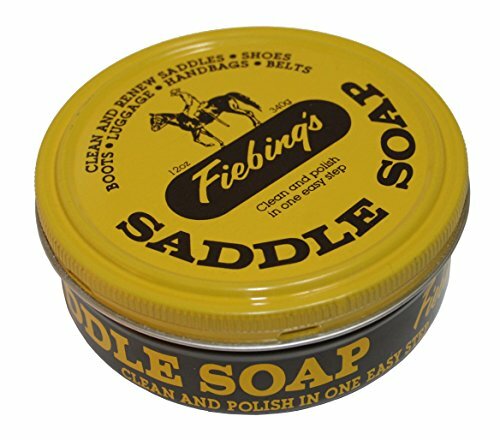 Fiebing's Yellow Saddle Soap Paste is ideal to clean horse saddles, harnesses, boots, baseball gloves, belts, handbags, furniture or any other smooth leather article. Saddle Soap Paste cleans leather and lubricates the fibers to prevent brittleness. If you have any questions about this product by Fiebing's, contact us by completing and submitting the form below. If you are looking for a specif part number, please include it with your message.